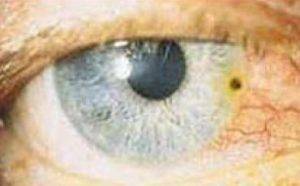 A common injury is a hot iron metallic foreign body embedded in the cornea. Grinding or drilling in iron or other metals will release particles that are hot and when they hit the eye, they embed themselves in the cornea. If it is iron, as in this example, it will immediately begin to rust due to the salty consistency of our tears. When the metal particle is removed, there is a remaining rust deposit that has infiltrated the surrounding cornea. We have experience at removing these rust spots. With proper medical treatment these injuries resolve well. If the foreign particle was embedded in the central visual axis of the cornea, there may be a scar remaining which could affect the patient’s ultimate visual acuity. Safety glasses are always recommended to prevent these types of injuries. Contusions, also referred to as a “black eye”, can result in more than just the obvious bruises on the face. The retina is the nerve tissue that senses light which lines the back of the eye. 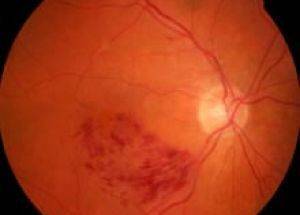 There is a blood vessel layer under the retina. This is very delicate and sensitive tissue. For emergencies during office hours, call 541-962-7753. After hours, call 541-786-3719 or 541-910-4151.